Setup your Southwest Wheel B2B ONLINE account and receive Net 10 terms and an additional 10% discount off online prices including volume pricing on all online purchases or order by phone, walk-in, or fax and still take advantage of our online volume pricing. If you are looking to spend $500 a month or $50,000 a month apply by filling out our Credit Application and receive approval within 24 hours. No matter if your business operates in Maine, Washington, Texas or any of the 48 contiguous states, we can establish a business line of credit that fit your company's or municipality's needs. Manufacturers, Dealers, Fleets, Goverment, and Schools are all welcome. Your company will receive an automatic 10% discount on each part's online price. 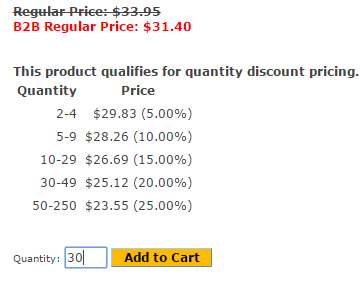 Applicable volume discounts will be calculated based on the new B2B price. Regular shipping charges apply and companies based in Texas have the option to pickup at our Dallas Warehouse. 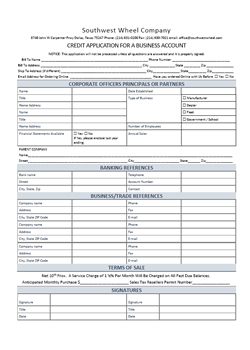 The credit application is completely filled out and emailed to [email protected] or faxed to 214-631-0907 - incomplete or attached standard references will be automatically denied. The company must have a free standing commercial or government/municipal zoned address. All orders placed online will receive an additional 10%, all phone, walk-in or faxed orders will receive standard pricing. You will receive an email stating approval and the amount of the credit line or if your company was declined. Companies that are approved will receive a second email to the primary order email informing you to reset your password. After you reset your password, you may log in, see your new pricing, and place your first order. Order receipts and tracking numbers will be sent to you by email and you will always be able to lookup either of these options in your online accounts. An invoice will be mailed when the order ships and statements will be mailed at the end of the month.